Why? Layers and layers of latex of course! I normally like to do slush casts, but due to it's size, I thought it best to add several layers of latex, to both halves, then sandwich them together. 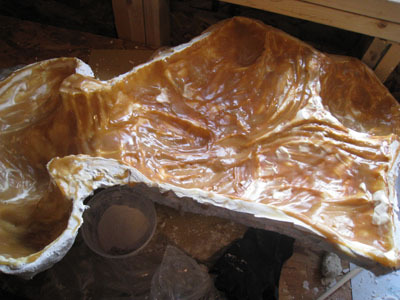 After MANY layers of latex, the pieces are finally ready to put together. I added a generous amount of latex all around the edges of the two halves, then smushed them together. 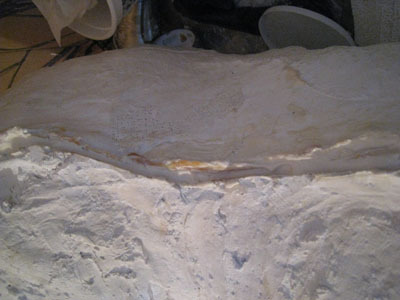 Then, I went over the cracks with more latex to make sure the two layers are sealed. It will take a couple of days for the latex along the seams to cure. Then I will fill the hollow interior with soft expanding foam.